Starting with Advance Steel 2011, anchors have their own category separate from the bolts. 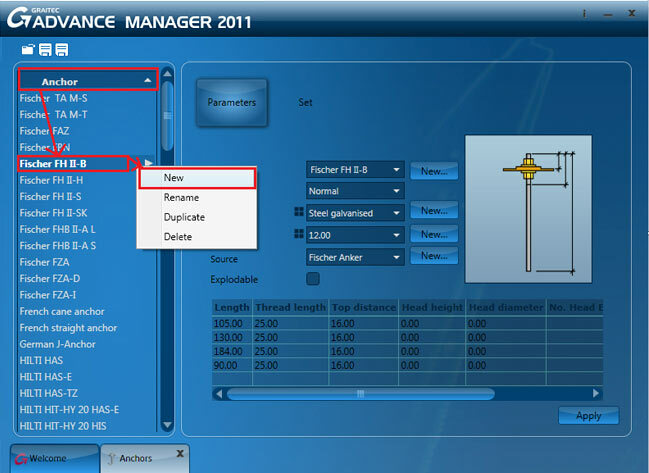 In the new Graitec Advance Manager (GAM) application the user can define anchors. 1. Open the GAM application, select "Settings" and then "Anchors". 2. Open the "Anchor" list and select any of the existing anchors. Right click and select "New" or click the "New" button next to "Name". 3. On the "Parameters" page, from the "Type" drop-down list you can select one of the following options: "Normal", "Headed", "Threaded", "Hooked" and "J". Every anchor type has a different display picture that helps when defining the dimensions. For the example in this FAQ select a "Threaded" type anchor. 4. 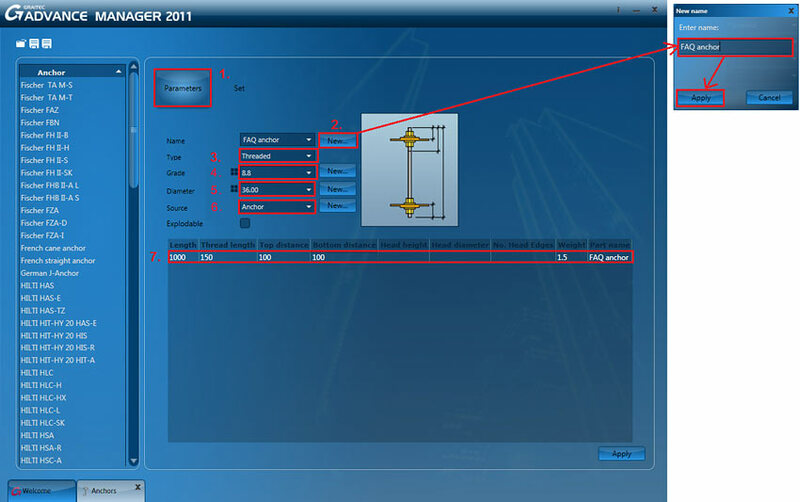 To create an anchor with another diameter or grade than the ones existing in the Advance Steel database, you can create one by defining a new diameter, grade or source using the "New..." button next to each field. 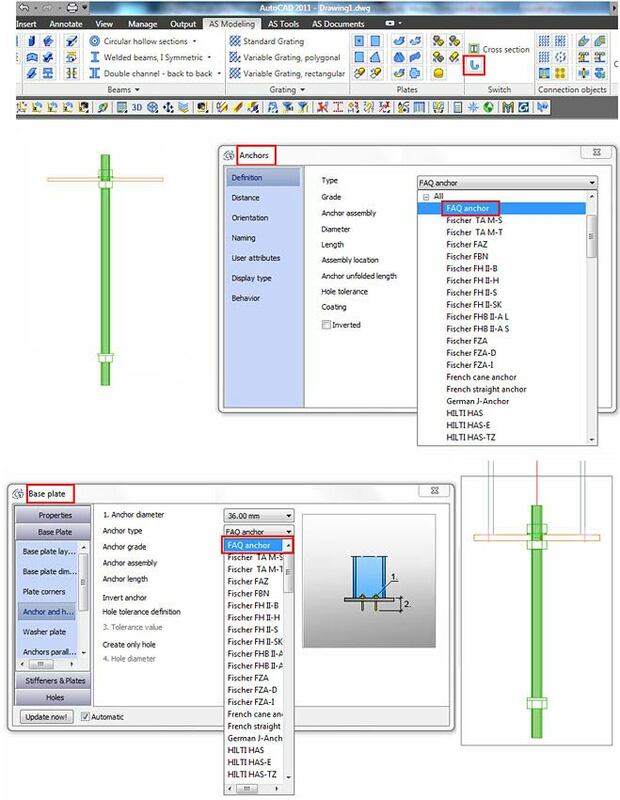 If you want to define a new anchor using the existing diameters and grades from the database, they are available in the drop-down lists. To define the name of the anchor click the "New..." button, enter "FAQ anchor" in the window and then click "Apply". For the grade select "8.8", for the diameter select "36.00", and for the source select "Anchor". Define the dimensions of the anchor as shown in the above figure. If you want to add more dimensions, click on a dimension field and press "Enter". Another line with empty fields will appear in which you can enter the new dimensions. The "Explodable" option enables the anchor to be displayed in the BOM lists separated in components; nuts, washers and anchor rods will be displayed separately, with the part name (e.g. "FAQ anchor"). If the option is not selected then the assembly will be displayed as a whole in the lists. 5. 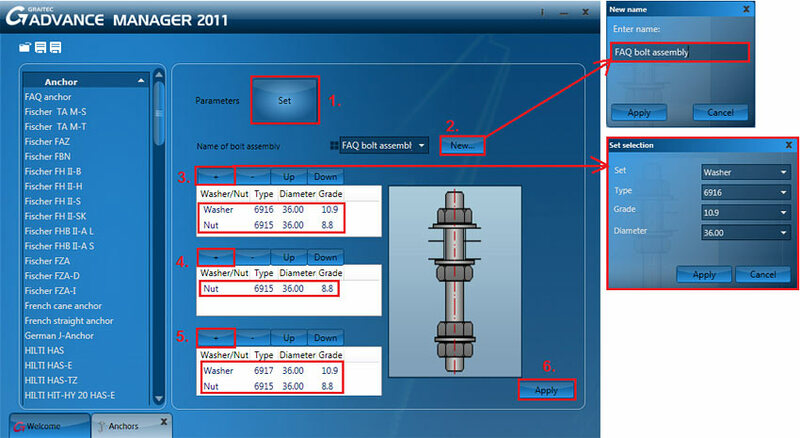 Select the "Set" page and create a new bolt assembly with the name "FAQ bolt assembly". Add nuts and washers as in the following figure and then click the "Apply" button to save the anchor. Close the GAM application. The anchor will be available as a connection object, when placed manually and also in the following base plate joints: "Base plate", "Corner base plate", "Base plate cut" and "Tube base plate".